FOR USE ON LOW MAINTENANCE AREAS ON GOLF COURSES, and EROSION CONTROL. Our improved kikuyugrass is a low growing, warm season perennial grass native to tropical Africa. It spreads vigorously by both rhizomes and stolons. The stems are covered with fine hairs. Kikuyu exhibits exceptional drought, disease, insect, and wear tolerance with rapid recovery rate. It exhibits good reception to winter temperatures, especially along the coast. 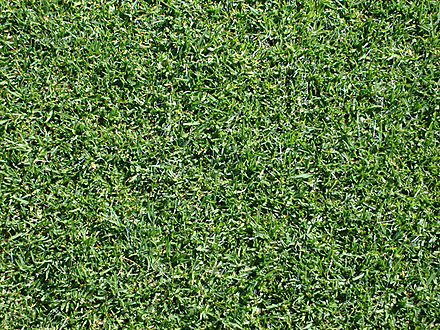 When compared to bermudagrass, kikuyu exhibits much better winter color and seldom goes completely dormant, eliminating the need to overseed. It also has a quicker green-up rate than bermuda. Because of its invasive characteristics, kikuyugrass is listed as a Federal Noxious Weed, however it is sold and produced in California, Arizona, and Texas with certain restrictions. In many cases, particularly on golf courses, common kikuyu has been a dominant turfgrass species. Rather than implement an eradication program, turf managers have developed maintenance programs to encourage kikuyu development. Drought, disease, insect, and wear tolerant. Quicker green-up rate than bermudagrass. More tolerant of shade in inland valleys than along the coast. 1” to 3” with reel at 1” and rotary at 3”.